The story of the night before Christmas is as American as baseball and apple pie. As American as stockings hanging over a crackling fireplace on, on, well…on the night before Christmas, don’t you know! We’re all familiar with the poem called The Night Before Christmas by Clement C. Moore; the story of the quaint little family that snuggles into bed and dreams happy dreams as they wait patiently for the arrival of Santa and Christmas – in that order. 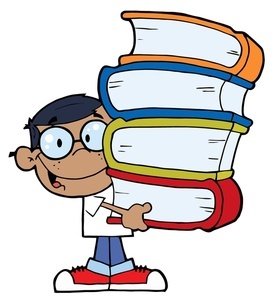 The story is a classic, and there’s no way anyone could add anything new to it. Right? Wrong! Artist Holly Hobbie breathes new life into this timeless classic with stunning illustrations of the Christmas you remember from long ago: The one before central heat, when you and your siblings huddled in front of a cheerful fireplace that warmed your front but left your backside icy cold. The one where your Mom hung the stockings (usually just colored socks) off the mantelpiece and stuffed them with fruit and peppermints and sweet little notes only a mother would write. Holly Hobbie captures this scene the moment the reader opens the book, and from there, it’s back down memory lane. There’s the hazy photograph of one lone house almost buried beneath a beautific snowstorm, and the sketch of four siblings huddled together in one bed (no separate rooms back then!) warm and secure as they settle down for the night. There’s also Dad peeking out of the window, with only a thin pane of glass (no storm windows yet) between him and the cold, just before he “throws up the sash” and is enveloped by a sparkling gust of fairy-dust snow. There are other priceless scenes that whisk the reader back to those kinder, gentler Christmases. There’s Santa whipping through the snowstorm by the light of the moon and expertly landing on the narrow roof; Santa popping out of the chimney, and Santa stacking toys under an old-timey, pine needle-y, hand-decorated Christmas tree that stretches from the floor to the ceiling. 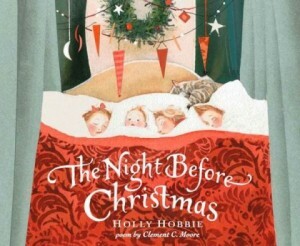 The Night Before Christmas “Holly-Hobby-style” is the same beloved classic you remember, but different at the same time. Yes, it’s the story we all know, but the breathtaking illustrations and the introduction of new character make it very different. In this version, the father is not the only one awakened by a noise and watching for Santa. The youngest of the four siblings – a wide-eyed toddler, wobbles out of bed and watches Santa from Dad’s easy chair. And of course he can’t believe his eyes. For a snow-filled, fun-filled, nostalgia-filled trip down memory lane – alone or with your own children or grandchildren — be sure to add this beautiful book to your holiday collection.